HIEBERT'S GUEST HOUSE Come as guests - leave as friends. 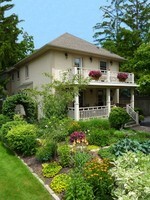 GRAPEVIEW GUESTHOUSE ON THE VINEYARD A Beautiful Vineyard B&B with a Victorian Jacuzzi Suite, minutes from Niagara Falls, affordable rates. KIA-ORA BED AND BREAKFAST You never really leave here...you just go home for awhile. SERENDIPITY B AND B At Serendipity you may arrive as a guest but you will leave as Family!! AS YOU LIKE IT B&B We have redefined value! VIA VENETO - OLD TOWN A little bit of Italy in Niagara on the Lake - Famous for breakfasts ! THE BUTLER HOUSE HISTORIC BED & BREAKFAST English Country Charm in the Heart of Old Town! TWO RIVERS NIAGARA B&B Two Rivers Bed and Breakfast is the place to be.